Rejection is a part of life. You fall in love – you get rejected. You apply for a scholarship – you get rejected. You propose to someone –you get rejected. And regardless of how sincerely we hope that none of you will have to go through this in life –especially the marriage proposal one, yikes – the fact remains that some of you will. And some of you want to be writers. It’s like begging to be rejected on a constant, everyday basis! Seriously, get ready for a boatload of rejection. Writer’s life is a hard one. You toil away alone, without anyone there to give you a hand. The best that you can hope for is a word of encouragement from your family and friends but that is about it. You must do all the legwork by yourself because no one can tell your story for you! But guess what? Sometimes it pays off considerably. First of all, it’s going to pay off anyway. Writing is a reward in and of itself and you do not need a publisher to validate your work. But getting your work out there sure is sweet. The key to accomplishing it? Persistence. 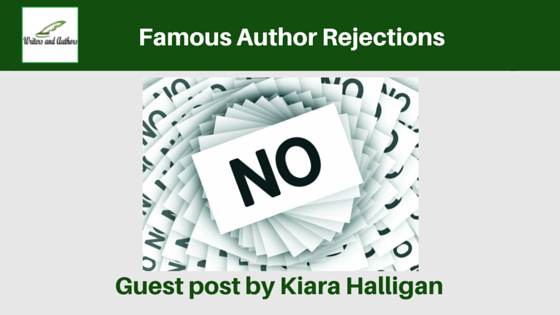 You’d be surprised at how many successful authors of our time faced rejection at one point in their career. Some barely even got the chance to get their work into print – remember, these are all works that have since then become world-acclaimed and some are taught in schools today! If you’re a struggling author check out the infographic by Galaxyessay and you’ll see that you are actually in a pretty darn good company! Kiara Halligan is an editor, blogger and contributor to different sites. She also has a keen interest in graphic designing as well and when she is not busy with work, she usually spends her time playing around with Adobe Photoshop and Illustrator.